Technology giant Microsoft has unveiled its third- generation Surface Pro 3 device with a larger surface area than its previous model but weighing lighter than a MacBook Air and expects it to replace laptops. The launch of the 12-inch Surface Pro 3 in New York city on Tuesday comes less than a year after Microsoft brought out the Surface Pro 2, which received positive reviews for being a powerful PC inside a tablet form factor but has struggled to gain traction in the market. The company announced the launch at its ‘small’ Surface event, but didn't launch the Surface Mini rumored to debut at the presentation. 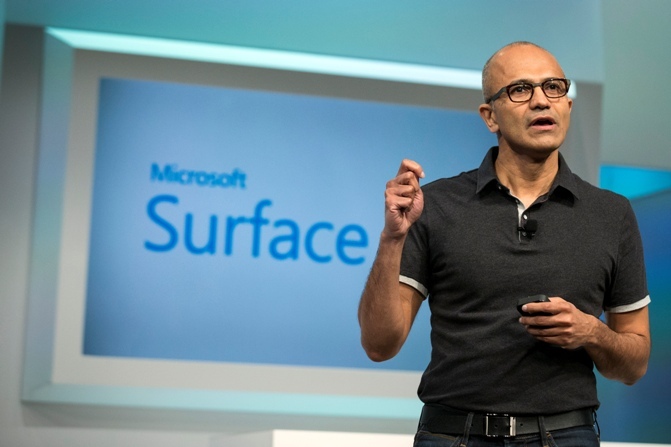 Image: Satya Nadella, Microsoft Corp chief executive, attends the unveil event of the new Microsoft Surface Pro 3 in New York May 20, 2014. Microsoft has its eyes set on getting business professionals on board with its new design. "Surface Pro 3 is a tablet and a laptop: multiple processor, RAM and storage options intersect with a sleek design that, with a simple snap or click, transform the device from a perfectly balanced tablet to a full-functioning laptop and back again -- all in a beautiful package that is 30 per cent thinner than an 11-inch MacBook Air," a press statement on the Microsoft website said. The pre-sale starts on Wednesday with an opening price of $799 for an Intel Core i3 version. Devices with i5 and i7 processors will also be available. 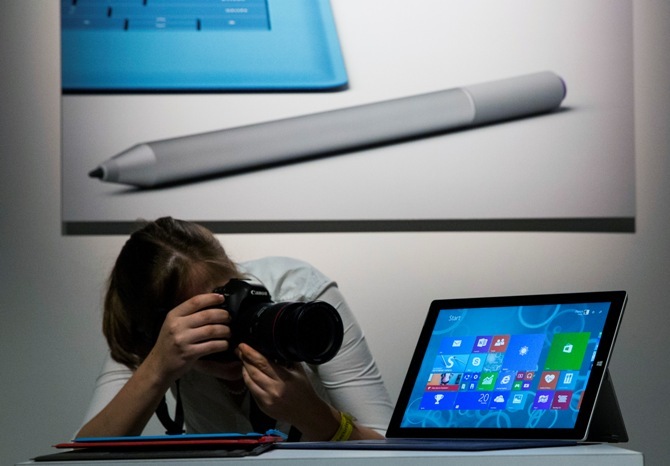 Image: An attendee photographs the new Microsoft Surface Pro 3, during the event in New York May 20, 2014. It weighs 1.76 pounds without a keyboard and measures in at just 9.1 mm, making it the "thinnest Intel Core product ever made," according to Microsoft. It comes with a 2160x1440 screen, microSD card reader and a USB 3.0 port. It also comes with an updated trackpad. "We got no praise for our (last) trackpad. We heard you," Panay said. 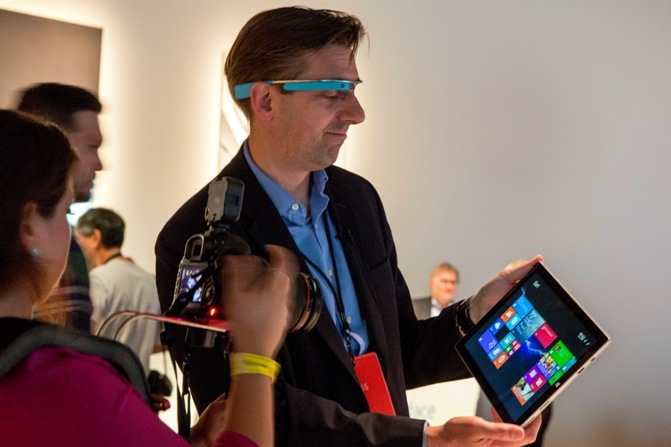 Image: An attendee wearing Google glass uses the new Microsoft Surface Pro 3, during the event in New York May 20, 2014. "In addition to an improved hinge, users can now tilt the screen to an angle of up to 150 degrees. 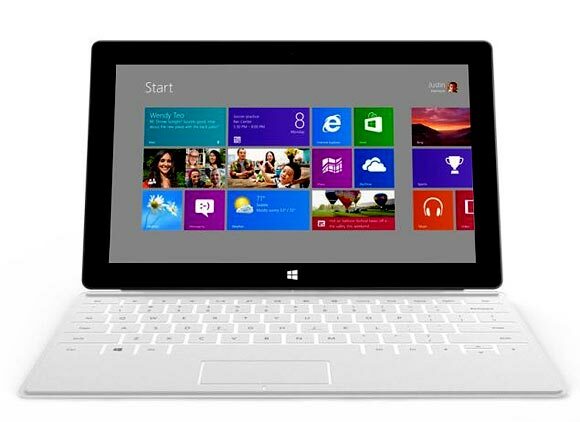 And the SP3 keyboard is now designed to capitalise on how it sits in your lap, cutting down on shaking that occurs when you type." The device also features a pen which during the on-stage demo seemed to work seamlessly when writing letters into a New York Times crossword puzzle. On clicking the pen, it turns into a note-taking app. The Surface Pro 3 comes with a fan that is said to be 30 per cent more efficient than other fans on the market. Also available is a new docking station that can push video to 4K monitors. 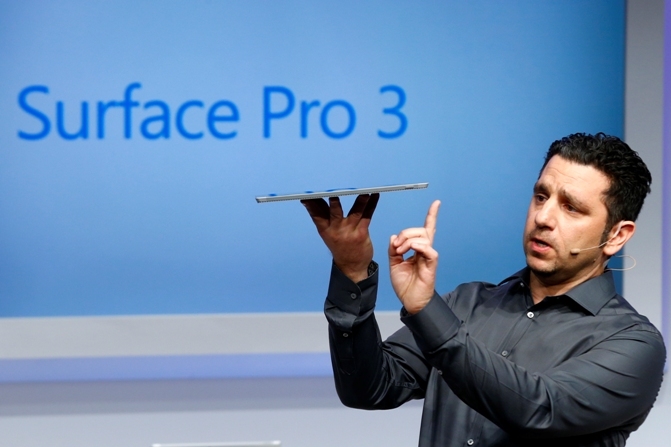 Image: Panos Panay, Corp. Vice President for Surface Computing at Microsoft Corp, unveils the latest models of the Surface tablet in New York May 20, 2014. Panay made it clear that the Surface Pro 3 aims to be both a tablet and laptop -- saying it has ‘lap-ability’ -- and thereby getting rid of the confusion for consumers deciding which one to buy. "(Tablets) are designed for you to sit back and watch movies, browsing the web and snacking on apps. “Laptops are designed to do something . . . editing and making. Sometimes they come out clunky or beautiful, but that is a design point and they are made for that reason," he said.